'Behind the Camera' is aimed at looking more in depth to the story behind the photos. 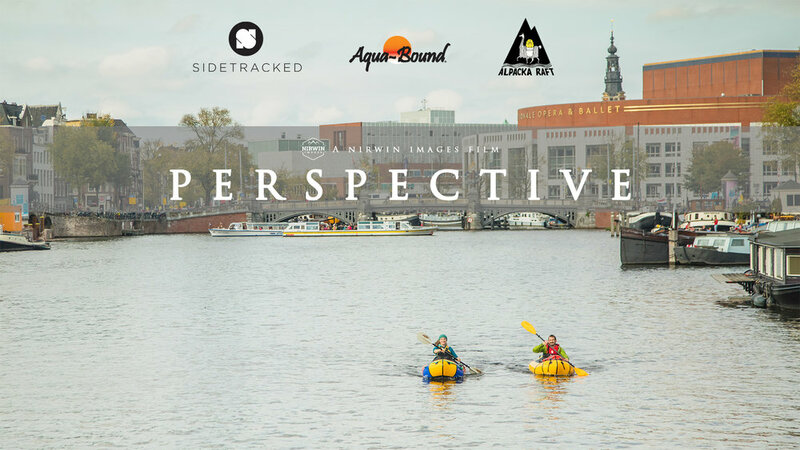 Earlier on in the year, I had been in contact with Alpacka, a packraft manufacturer, about wanting to shoot a series of photos about Urban Packraft exploration. Seeing as I live in London and there are a small number of canals, I thought it could be a good way to showcase how these little rafts are not just for grand adventures, as well as wanting to get out and use my packraft more often. A few weeks later, they contacted me about this idea, and put me in contact with Jacob, known as The Urban Packrafter. There was lots of discussion over the next several weeks, and so I approached the idea to Sidetracked Magazine about producing a story on their behalf about Urban Packrafting, with the idea to create a film, a written article and a set of images to co-inside with the article. We were all keen on the idea, and the go-ahead was approved. Not long afterwards, Aqua Bound were also brought on board as a co-sponsor. Scottish packrafter and Alpacka ambassador Annie Evans also joined the team. Having had a chat with her and understanding that the vast Scottish wilderness was her playground, I found out that she hadn’t really pursued the idea of urban packrafting before. It was from this aspect that I decided to base the story as I thought it would make for a unique but simple urban adventure. The shoot was set for mid October, early Autumn. We were going no matter what the weather, although by some lucky chance, we must have caught an autumnal heat wave when we arrived. We couldn’t believe the amount of sun we were getting! Surprisingly, Film permits are not needed in Amsterdam to film, yet it is advisable to notify the authorities of your intentions. Within in a few days, I was able to secure a film permit with the Amsterdam Film Office, and everything was all set. I had been in contact with several people within the European Packraft Community, one of whom was happy to help when he could. Konstantin Gridnevsky is a Russian living in The Netherlands, and was a valuable helping hand showing me around Amsterdam having local knowledge on his side, as well as being a valuable helping hand in many different ways as he himself knew several other people who could help. Filming went relatively smoothly. Certainly burnt of a fair few calories running and cycling around the city grabbing shots from various angles. As a packrafter myself, I had contemplated taking my raft with me, but thought it would take up too much time and be cumbersome to carry it around as well as all my filming equipment. Instead, I had hired an electric boat for a few hours as this was easier, quicker and less tiring to use than paddling everywhere, and vital to get the on-water shots to showcase rafting in an urban environment. Amsterdam was certainly an eye-opening experience. I had never been to the city before and had only heard the infamous rumours about the city. Let’s just say it’s something you need to experience for yourself. I couldn’t believe though the amount of cyclists that were speeding around. I didn’t even know there were specific cycle lanes until someone had told me about them and to watch when crossing roads as you’re more likely to be hit by a cyclist than a vehicle. After having hired some cycles for us to all get around, I can understand why they do it. Walking around Amsterdam would certainly take a while, but cycling however would only take a few minutes (although it helps if you don’t get a puncture like my bike did!). The edit is where the story get cut together. It was a fairly simple story that I was able to lay down roughly quite quickly. It was however, all the small changes that take up the time and effort to get exactly how I want it to be. I try to be a perfectionist within everything I do, so getting things right was essential. Yet after several weeks of watching, reviewing, analysing, inspecting and dissecting, I was finally happy with my finished film. A simple story of how a packrafter decides to push her comfort zone, and explore an urban environment. If you haven’t seen it before, please feel free to watch the film below.